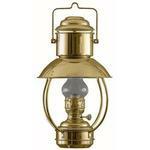 Welcome to OceanFare's Collection of Authentic Nautical Lamps! We are proud to carry a distinct and very unique collection of nautical lamps and decor that has impressed even the most saltiest of sailors! In this collection we carry everything from real, half-mile search lights to wall-mounted nautical light fixtures, and even hanging nautical light fixtures! While many of our lamps are designed to possess a 20th century look and feel, they carry elaborate and elegant details that amaze and delight guest of all ages. Our captains cabin light fixtures even feature frosted glass and hand etched pictures. While all of our lights can be converted to run electrically, some of our lamps are still sold to be used with oil standard! Feel free to call us directly with any questions or to begin an order. Your call is toll-free and our staff is always happy to help!